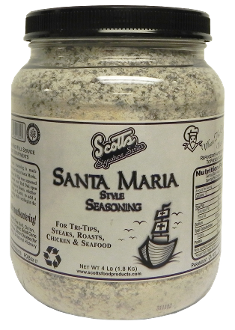 Santa Maria Seasoning is made famous by the folks in Santa Maria, California where Tri-Tips were seasoned and slow cooked over Red Oak open fires. Use on Steaks or Roasts, whether it's Beef, Pork or Lamb, to add a flavorful coating while sealing in the natural juices. THIS IS A FOUR POUND PARTY SIZE JAR! REFRIGERATE AFTER OPENING TO PREVENT CAKING! ***SANTA MARIA GIFT PACKS ARE AVAILABLE UNDER "ELEGANT BASKETEERS"*** INGREDIENTS: Sea Salt, Onion, Garlic, Spices, Organic Dried Cane Syrup, Dextrose, Silicon Dioxide for free flowing, and Natural Hickory Smoke.